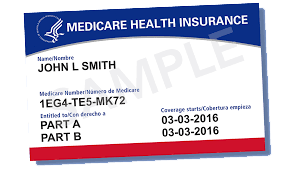 As the federal government undertakes a major initiative to issue new identification cards to the Medicare beneficiaries in Michigan and nationwide, an AARP survey finds that a majority of those enrollees are at risk of being victimized by fraud schemes designed to capitalize on the card replacement program. In response, AARP — including AARP Michigan — will participate in an education campaign to raise awareness among consumers about Medicare Card scams. Read full article on AARP website. Hantz Financial Consultant Chris Kemp (far right) at the Coldwater/Branch County Senior Health Fair with Goldwater Chapter Board members (left to right) Jackie Russell (chapter secretary), Bing Johnson (chapter president), Patricia Cox (chapter board member), Gordon Gentry (chapter vice president) and Mary Jensen (chapter board member) board member. SERA is committed to providing exceptional value to its members by delivering quality financial products and services to our members through our SERA Plus program. Consistent with our philosophy, we are pleased to announce that financial planning, investment, insurance (including auto, home and liability), tax planning, estate planning advice, and banking services will soon be offered exclusively through our relationship with Hantz Group, Inc., and its affiliates (together, “Hantz”), headquartered at 26200 American Drive, Southfield, Michigan 48034. Our decision to offer financial planning, investment, insurance, tax planning, estate planning advice, and banking services through Hantz allows us to provide you with a variety of financial services under one roof. Hantz Group, along with its affiliates, Hantz Tax & Business, LLC, Hantz Agency LLC and Hantz Bank, to name a few, provides a comprehensive approach to your specific financial service and banking needs. Hantz will offer and provide its services through its 21 locations conveniently located near most of our chapters throughout Michigan. For more information on Hantz, including locations, please visit www.hantzgroup.com or contact our SERA Plus program administrator, Cheryl Streberger at 517-515-9815, or your SERA Chapter Liason. SERA is an non-profit organization devoted exclusively to issues and concerns of all current and future retirees of the State of Michigan. keep Michigan state employee pension and insurance benefits secure. assure pension and insurance benefits are improved and keep up with inflation. monitor and take action on important developments affecting state pension and retiree health care benefits. inform its members about proposed federal and state legislation that will affect State of Michigan retirement systems and retiree health care. stay in touch with old friends and make new friends with a common background. monitor the State Employees Retirement Systems Board, the Investment Advisory Committee (which makes recommendations to the State Treasurer on investments in the State Employees Retirement System pension fund), and the 401K and 457 programs provided through Voya. work with the Office of Retirement Services and Civil Service Benefits Division to help retirees and near retirees with their pension and benefits issues. provide SERA PLUS, great discounts and services in many areas of retirement living such as first-year free tax preparation, estate planning, tax planning, home and auto insurance, financial services, mortgage services, estate transfer strategies, final settlement planning, and much more through SERA’s association with Hantz Group, Inc..
SERA works through its members, leaders, and committees to promote the best interests of state employee retirees and future retirees. At least eight times since 1974, SERA was a moving force in pension increases or benefit improvements. In 2011, we opposed the pension tax and helped eliminate it for 70% of retirees; we opposed the remaining tax on public pensions for those born after 1945 in the Michigan Supreme Court. We opposed the recent state employee retirement system changes. That work continues. 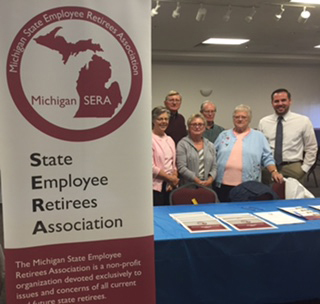 SERA has 21 local chapters statewide that are linked through the Coordinating Council of the State Employee Retirees Associations of Michigan (the SERA Coordinating Council). SERA chapters have periodic meetings with guest speakers, opportunities for networking, newsletters, and other activities. SERA welcomes the new ideas and energy of new members! To join, contact Cheryl Streberger at 517-515-9815 or cstreberger@yahoo.com.